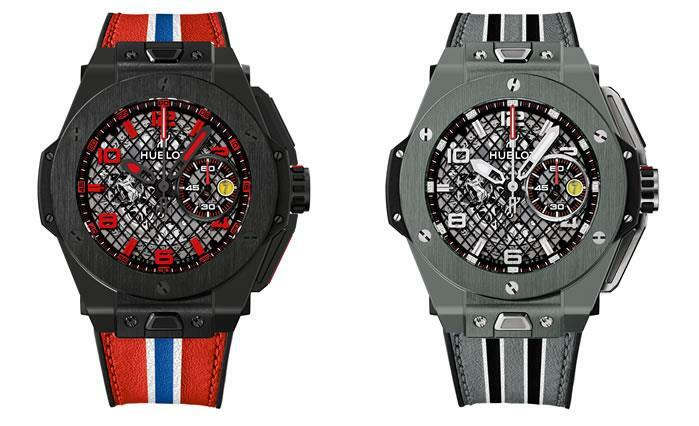 Presenting the new BIG BANG FERRARI watches ! 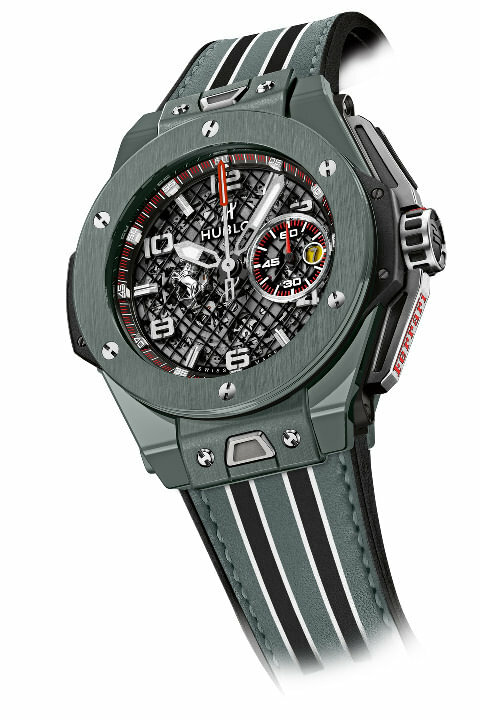 A fantastic third year of collaboration between Ferrari and Hublot is coming to an end. Following the launch of the first two watches, the Big Bang Titanium and the Big Bang Magic Gold in 2012, the famous MP-05 LaFerrari – the only watch in the world with a 50-day power reserve – three Big Bang models in 2013, three Big Bang models in 2014, two new Big Bang Ferrari “racing” versions have now been unveiled. Exceptional sports watches in honour of exceptional racing cars. In 2015, to celebrate the 10th anniversary of the Big Bang, Hublot is unveiling two new models developed with Ferrari: the first is the aptly named Big Bang Ferrari Black Ceramic, which is adorned with details in Ferrari’s legendary red colour; the second is the Big Bang Ferrari Grey Ceramic, inspired by the historic NART (North America Racing Team) livery. Constructed on a 45 mm diameter chassis in black or grey ceramic, the sporty design of the new Big Bang Ferrari models is enhanced by a profiled aerodynamic dial through which the depths of the movement can be glimpsed. The UNICO manufacture movement is dominated by the unique and distinctive Ferrari grille – a blackened criss-cross mesh which clearly reveals the main plates and bridges of the movement. The dial features an appliqué of the iconic prancing horse at 9 o’clock, while the minute counter and date window appear at 3 o’clock in the colours of the Ferrari shield. The predominant colour on the strap also reflects the aesthetic of the dial, with indices and hands featuring a rhodium-plated finish for the grey ceramic and red varnish for the black ceramic. Recalling the distinctive codes of the five-spoke Ferrari wheels, the oscillating weight is visible beneath the transparent sapphire case-back. Clearly displaying its affiliation with the automotive world, the new Big Bang Ferrari is available in two versions – black or grey ceramic – each numbering 250 pieces. They both have a 72-hour power reserve. The UNICO movement is designed, developed, machined and assembled by the micro-mechanical engineers, engineers and watchmakers at Hublot. Other features: a practical flyback chronograph which can be reset at any time, and which is unique in the watchmaking industry, two push-buttons, with date indicator, and featuring a uniquely positioned mechanism with dual coupling and the famous “column wheel” visible on the dial side. Its development required a completely original approach and thinking outside the box: For example, the hour counter is driven directly by the barrel, and there is no jumper in the chronograph mechanism. This simplification boosts reliability and robustness. Its pallet fork and escapement wheel are fixed to a removable platform and are made from silicon, whose lightness provides a guarantee of performance. Its construction, which incorporates just 330 components, has been simplified as much as possible in order to further increase robustness. This result is the fruit of continual adjustments made since 2009, the year it was launched, which have been carried out jointly by the technical office, the laboratory and the after-sales service in the manufacture. Its frequency of 4 Hz/28,800 vibrations per hour and its immaculate finish are also a guarantee of high chronometric quality. Finally, its automated production, which includes automation of the machining, stone fitting, oiling and numerous assembly operations also ensures consistent, controlled quality. Its power reserve is around 72 hours.